The third Liv Bergen mystery picks up right where the second one left off: the murder of Liv's sister-in-law has been solved, but an older rancher has been bludgeoned to death in a style eerily reminiscent of a long-inactive killer known only as the Crooked Man. FBI agent Streeter Pierce, still on assignment in Sturgis, South Dakota, must now turn his sights on tracking down the killer, who happens to be his nemesis from ten years earlier. Pierce doesn't complain, though; he's falling in love with Liv Bergen and sets in motion an unconventional way to recruit her for the FBI's training camp in Quantico, Virginia, as they work the case together. But is Liv falling for the brilliant, exotic-looking agent Jack Linwood instead? Once again, Liv's vast knowledge of the Black Hills of South Dakota--the territory General Custer made famous--and the modern day ranchers and environmentalists who live there leads her to unearth critical clues about the Crooked Man. Aided by her elfin sister with rainbow-colored hair, a sad-eyed bloodhound, and a terminally ill Norwegian widow, Liv ultimately identifies the deranged killer. But will her barrage of questions be enough to fend off a fatal blow from the very cane he used to crush the skulls of thirteen other victims? Sandra Brannan's third book in the Liv Bergen Mystery series, Widow's Might, is the juicy mystery readers would love to sink their teeth into night after night. There's something between its pages for every reader to enjoy, even if they are discovering the series for the first time. Brannan's writing praises the beauty of the Black Hills of South Dakota and places readers in the thrilling moments of action and investigation. The butterflies rumbling in the stomach of fans in anticipation of the next Bergen mystery, Noah's Rainy Day, are unsurprising and completely well-founded. Liv is adventurous, lively, and prone to run into trouble at a moment's notice. It may be the reason she clicks so well with the FBI agents she's working with to solve the 'Crooked Man' case. Special agents Streeter Pierce and Jack Linwood are the polar opposites of Liv, all business and hardly any play, but the chemistry she has with both hunky men is undeniable. It's a fun change in tone to read the budding romance between the progression of a twisted mystery. 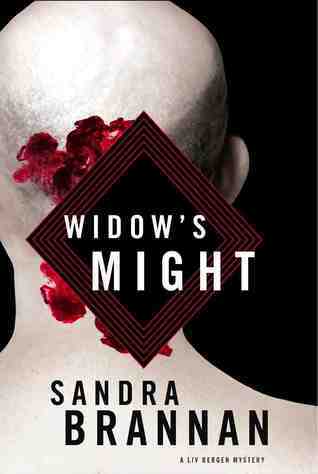 Finding clues in patterns and landmarks, connections and history, makes Widow's Might a very clever and realistic read. Every page, thought, or action is a potential give away for the identity of the killer, but Brannan makes sure to tease readers until the case is closed! Besides Liv's endearing personality, Widow's Might's addictive plot has the ability to draw in new fans and entertain the already loyal ones. Sandra will be on tour this fall; see if she's coming to a town near you!